Cyber threats are continually growing in their scale, intensity and impact on the global economy. Transatlantic cooperation to build cyber resilience is integral to combating this truly international challenge. 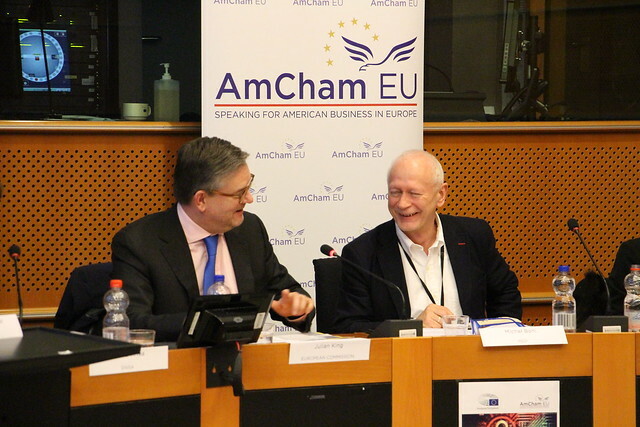 This message was emphasised during the ‘Building a Transatlantic Response to Cyber Resilience’ event, organised by AmCham EU and hosted by MEP Michal Boni on Wednesday, 21 February in the European Parliament. In the presence of more than 50 participants, Sir Julian King, European Commissioner for the Security Union, delivered the keynote address and highlighted the vast scope of cyber threats, which have an impact on economic stability, the integrity of democracy and the safety of consumers. Commissioner King urged for the engagement of the private sector to raise cyber resilience, calling for more industry-led initiatives. The panellists, representing EU and US industry as well as the European Union Agency for Network and Information Security (ENISA) and the US government, debated the best means to achieve resilience with a focus on the voluntary nature of the cybersecurity certification framework and the need to push for international cybersecurity standards beyond the borders of the European Union. The need for strong stakeholder involvement was stressed throughout the discussions. Speakers also discussed priorities for the scope of EU certificates. AmCham EU welcomes the proposal to convert ENISA into a permanent security agency and supports a voluntary and market-driven EU certification framework. AmCham EU’s full position can be found here.